Windows 10 Creators Update: what’s new? Microsoft decided to inspire an inner creator that hides inside all of us with Windows 10 Creators Update. On April 11th the company released the massive update for Windows 10 users. It is the biggest OS upgrade since Anniversary Updated last autumn. Microsoft introduced a bunch of new features that are supposed to allow unlocking and empowering creativity in safe Windows environment. People who have a passion for media, design and entertainment industry should appreciate and enjoy novelties related to graphic design, music, gaming and reading e-books. However, user’s security has not been left behind. Microsoft also improved options for managing security options. Thus, in the article, we would like to reveal new ideas and functions from Microsoft camp. 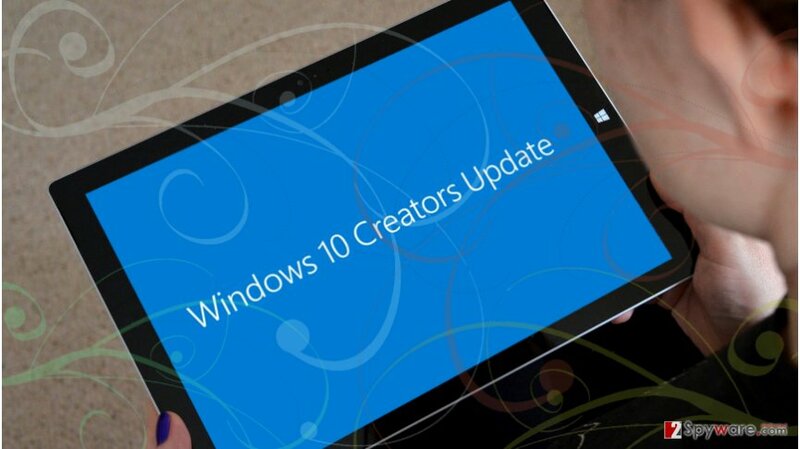 Windows 10 Creators Update focuses on creative industries and entertainment. It’s hard to imagine Windows without built-in Paint app. This time Microsoft offers upgraded this simple graphic design program, and now it has a focus on 3D modeling technology. Nevertheless, 3D does not look like simple technique; Microsoft claims that painting with this tool has never been so easy even for those who do not have high skills. In order to improve gaming experience, Windows 10 offers a game Game Mode. Enabling this mode ensures that games run at maximum quality. This mode is designed to make background tasks and applications to use fewer computer resources. Thus, even if your computer is not perfect for games, this mode helps you to become involved and enjoy games without sluggish performance. Book lovers should also be excited about Creators Update. Windows Store now has a new digital category that allows reading e-books by various popular authors. However, it’s not the only feature that helps reading more convenient. Microsoft Edge browser also has a default reader for online books. Thus, users do not need to install any additional software to read latest electronic copies. Talking about Microsoft Edge browser, it seems that company has high expectations to make it a competitor to the popular Google Chrome and Mozilla Firefox. According to the company, Windows Creators Update made Edge faster and more secure than Chrome and Mozilla. Apart from technical improvements, Edge also has new useful feature for multi-taskers and creative thinkers who always have hundreds of tabs opened. Edge now allows managing tabs more convenient and offers tab preview function. Thus, users can have a quick preview of each opened tab by simply scrolling through them with touch, touchpad or mouse wheel. The irreplaceable digital assistant of Windows 10 – Cortana – also experienced few updates. Now the assistant can help you enjoy listening to the favorite music. Users can tell Cortana to play music by mood, category or even activity. Thus, if you feel the need for a boost of energy while doing housework, you can simply tell Cortana to play some funk music. Other upgrades include improvements to built-in apps which are supposed to have better experiences using Windows Photos, Windows Maps, Groove Music, and Movies & TV apps working across Xbox and Windows Mixed Reality. Microsoft also paid attention to security and find new ways to make browsing the web safer. An updated Windows Defender Security Center now has a dashboard that helps to manage all security options from one place. Besides, Besides, Window Defender Advanced Threat Protection (ATP) now has new features that allow responding to network attacks. Thus, Windows continues working on security-related issues and tries to protect users from all possible cyber threats. The automatic Windows 10 Creators Update might take up to several months. However, if you cannot wait until you see the prompt window informing about upgrade waiting for you, you can install them today from the Update Assistant. ^ Mollie Ruiz-Hopper. What’s new in the Windows 10 Creators Update. Windows Blogs. The blog about Windows features and news. ^ Michael Moore. Windows 10: Microsoft Paint is getting a MAJOR makeover. Express. Latest UK and World News, Sport and Comment. ^ Peter Bright. Windows 10 Game Mode: Free FPS boost of a few percent, with more to come. Ars Technica. IT news, reviews, and analysis. ^ Kyle Pflug. What’s new in Microsoft Edge in the Windows 10 Creators Update. Windows Blogs. The blog about Windows features and news. ^ Windows Defender Security Center in Windows 10 Creators Update. The Windows Club. The website discusses & offers Windows 10/8/7 Tips, Tricks, Help, Support, Tutorials, News, Freeware Downloads, Features & more. This entry was posted on 2017-04-12 at 08:24 and is filed under News.